If you celebrate Easter and have some last-minute shopping to do, here are some tips for keeping your Easter basket eco-friendly! Make sure you choose your Easter chocolate wisely! For..
Saint Patrick’s Day is all about the color green—so what better way to celebrate than by doing it in an “All Green” manner? Earth 911 had some great tips..
Is it just me, or are electronic greeting cards taking over the card aisle at the store? The singing or..
Photo Credit: Earth911.com: Amanda_Wills Reusable shopping bags and water bottles are standard—but how much thought have you given to other..
How do you celebrate Thanksgiving? It probably involves some combination of family, travel, and food. What can you do to have an eco-friendly Thanksgiving dinner without sacrificing your favorite traditions?.. Blue jeans are an American staple, but I have some bad news for you: they aren’t so great for the environment. The average pair of blue jeans consumes approximately 919..
It’s almost Halloween and we all know what that means—costumes, candy, and pumpkins galore. So how can you have a fun, eco-friendly Halloween? Make your Halloween costume out of items..
Why Haven’t You Gone Green Yet? This is kind of an exciting day—not only is this our 200th blog post, but we also hit 2,000 Twitter followers today. Thank you to everyone who reads our blog,..
How are you celebrating Labor Day? If you’re from the US, there’s a good chance you’re having some kind of barbecue. Why not reduce your carbon footprint and make it..
We all have an environmental compromise or two. I start almost every day with a cup of coffee—even though I know there are greener options out there. And I’m not..
Every couple of days, I journey to my mailbox—inconveniently located on the opposite side of the apartment complex—and empty my junk mail straight into the recycling bin. I do pretty.. If you want to work in a green industry, you might be in luck. Between 1998 and 2007, job growth in the green industry was nearly 3 times as much..
We all accumulate odd items and wonder how to reuse or recycle them. After all, it seems like a waste to throw away a perfectly good item if it can..
Have you ever wanted to live in a place where you could forgo your car and walk everywhere? It wouldn’t be possible to do this in some cities, but you.. Image Credit: istockphoto.com Can you sort out fact from fiction when it comes to the green industry? 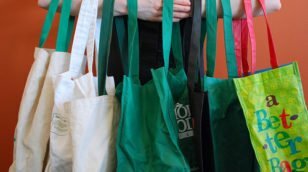 Let us know your thoughts about these eco-myths: Myth: Renewable energy receives more..
Do You Have Too Many Reusable Bags? Photo Credit: Earth911.com: Amanda_Wills In an effort to stop using plastic bags, I’ve accumulated 9 billion reusable ones. Does that sound familiar? When I learned exactly how bad plastic bags..
Would you live in Florida, Southern California, Texas, Arizona, Georgia, or New Mexico if there was no air conditioner? All of these areas have experienced above average growth in the..
Photo Credit: Epic Fireworks (Flickr) It’s almost the 4th of July and we all know what that means—barbecues, fireworks, and red, white, and blue galore. Here are a few tips..
Credit: PBWorks.com Summer has only been here for a week and people are already wondering, “How do I stay cool without the air conditioner?” Although you might need to resort.. Happy summer! Today is the first day of summer, and we all know that summer comes with heat, popsicles, and keeping cool. So how does an eco-conscious person go green..
To put a large, controversial topic in simple terms: Pesticides are bad. Organic food doesn’t have pesticides, so it’s good for you. Right? Even though it’s more complicated than that,..
Do You Recycle Plastic Water Bottles? Photo Credit: Sessions.edu Do you recycle your plastic water bottles? If so, you’re in the minority. Surprising, right? Earth 911 claims that only 27 percent of plastic water bottles in..
How Green is the iCloud? Credit: Apple What did you think of Apple’s iCloud announcement? I wasn’t sitting by my computer refreshing the screen or anything, but I did keep an eye out for the..
Photo Credit: wnsr.parsons.edu If you read eco-news or participate in green communities, you’ve probably heard of the term “greenwashing.” But do you know what it is? What is Greenwashing? Greenwashing.. Image Credit: FamiliesAndSchools.org It’s a common myth that making green choices is difficult and expensive, but it doesn’t have to be. Here are five things that you can do right.. I strongly believe that when it comes to helping the environment, every little bit counts. Going green sounds like it will be but it doesn’t have to be. This infographic..
Fair Trade, Organic, or Local? Photo Credit: Wikipedia Commons Grocery shopping can be difficult. How do you make the best choice for yourself, your wallet, your ethics, and the environment? Here is a quick rundown.. Image Credit: FamiliesAndSchools.org Have you ever wondered how much of a difference all of those little green habits make? Are you really saving energy by switching light bulbs? Do those.. Does green marketing encourage people to make eco-friendly choices? A recent study by OgilvyEarth says that it often has the opposite effect. The study called “Mainstream Green: Moving Sustainability from..
Are you trying to go green? Don’t fall for these common myths: Myth: Going green is expensive. Fact: Although some green products are expensive, not all of them are. Some..
Credit: BrownSWCD.org In honor of World Water Day on March 22, here are 10 easy ways to conserve water: Fill a pitcher or a water bottle with water and keep.. In honor of St. Patrick’s Day, I thought I’d share this fun infographic with you called “Green Through the Ages.” It has a lot of fun facts on it. For.. I recently came across “Recycle This,” a blog with interesting reuse and recycle options for a variety of common household items. Although the site is based out of the UK,..
Photo Credit: PropsUnlimited With rising gas prices and the negative impact gas has on the environment, saving gas can only be a good thing. It’s easy to tell people to.. Recycling Tip: How clean do containers have to be? Many recycling facilities instruct you to clean out food and beverage containers before putting them in the recycle bin. But how clean do they really have to be? Is it..
We all know that Valentine’s Day isn’t one of the greenest holidays around. There are all of those cards, candies, flowers… Are you trying to find a last-minute, eco-friendly Valentine’s..